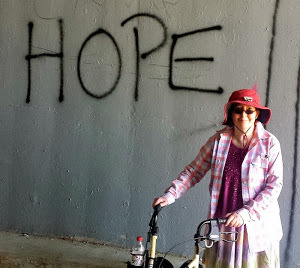 Coma Chameleon: My Recovery Chronicles: Handing out presents on Santa's trusty...butterfly? Handing out presents on Santa's trusty...butterfly? This is my brain on strokes. 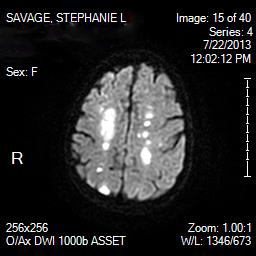 At least the MRIs finally proved that--despite all evidence to the contrary--I'm not completely brainless. The MRI images of my brain after my strokes on both sides of my brain are pretty horrifying. But, contrary to what my doctors proclaimed, it didn't signify "profound brain damage." The proof is that I'm writing this now. On the other hand, Eben Alexander was not even in a natural coma. He was in a medically-induced coma because his meningitis made him so mentally altered that he was lashing out at the doctors trying to save his life. Therefore, the only reason he was unconscious was because of the drugs his doctors gave him. Here are the words of one of the doctors treating him, as quoted in the famous Esquire expose of Eben Alexander. The doctor's report clearly shows that Alexander was most certainly not brain-dead. Every time his doctors attempted to remove him from sedation, he became uncontrollable again and they were forced to put him under once more. Here's a quote from Proof of Heaven. "During my coma my brain wasn't working improperly—it wasn't working at all." Yet, his brain worked perfectly fine--if manically so--every time his sedation was lifted. My brain, on the other hand, wasn't supposed to be working at all, at least according to my doctors after they viewed my MRIs. This is ironic considering that I think my consciousness was actually restarted by those very MRIs. (The distinctive MRI voice was the first datable element in my coma-dream.) Or, more accurately, it was activity related to the MRIs--especially moving me--that jumpstarted my cognition. Near-death experience true believers like to cite the fact that Alexander is an neurosurgeon to bolster his literally unbelievable claims. But if he were being a true man of science, he never would've claimed that his brain was actually dead during his experience. His brain was no more dead than Claire Wineland's was when she had her non-spiritual coma-dream. She was in a medically induced coma too. The web is rife with coma-dream experiences told by people who were in drug-induced comas. Eben Alexander's story is simply one of them. It's such a common experience that it's not covert enough to be considered covert cognition. Here's a Livescience article about medically induced comas, which ends with the dreams and hallucinations often experienced by patients: What is a Medically Induced Coma? My favorite account was from a Disqus member called NoAZPhilsPhan. It was in the same article about Claire Wineland's video What It's Like To Be In A Coma I've referred to repeatedly. People were always telling him that he had an NDE, but he had reasons to doubt it. 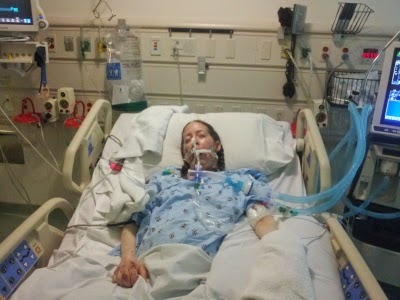 I was in a 10 day coma, medically induced the last few days, after I passed away on the OR table during emergency surgery. Many of my organs, like my kidneys shut down. I remember walking down a very, very wide hallway. On each side there were massive doors that opened up to beautiful scenes like valleys, fields with lakes, tropical beaches and the like. I remember hearing someone playing the guitar and singing, over and over again, "Knock, knock, knockin' on Heaven's door". After a little while I realized it was a dear departed friend of mine who was a musician so I said "Bob, is that you?" ( I could not see him only hear him). He said "Yea, it's me buddy, but we don't need you right now why don't you go home." So I turned around and walked back.I had many people say to me that it was an afterlife experience. I'm not so sure of that because all of this happened around Christmas time and during my coma I also helped Santa Claus deliver presents to Norway and England. Oh, by the way... those soda drinking polar bears are real as well.... I met them and we went sledding. Coincidentally, his coma came around Christmastime. He didn't he ride on the wings of a giant butterfly, as Alexander claims, but perhaps he could've combined the two. Instead of using Santa's trusty sleigh, they could've given Rudolph the night off and hitched a ride on a giant butterfly.